Figure 22 in King Hubbert's report "Nuclear Energy and Fossil Fuels," Publication No. 95, Shell Development Company, Exploration and Production Research, Houston, TX, June 1956. King Hubbert tried to address the question of finite resources and today we know he was wrong. Even though Hubbert cycles emerge for individual oil provinces, they cannot emerge for the world. We have been predicting the peak of global oil production for a long time and it never happened up until now. Technology will always be ahead of geology and, therefore, we will continue to produce ever more petroleum each year, just from different places, and at a higher price. Oil shale plays in the U.S. and elsewhere are such technological game changers that they will offset the ongoing declines of the conventional petroleum reservoirs such as Ghawar, Burgan, Cantarell, Samotlor, Prudhoe Bay, and many others. I definitely encroached on the deeply held, personal beliefs of some of the members of my audience, and they became rather upset with me. But their arguments are at the center of the national myth in the U.S., which means that I am in a small and unpopular minority. These people believe that perpetual growth is desirable, consequently it must be possible, and so it can’t possibly be a problem. At the same time there are still a few remaining “spherical earth” people who go around talking about “limits” and in particular about the limits that are implied by the term “carrying capacity.” But limits are awkward, because limits conflict with the concept of perpetual growth, so there is a growing move to do away with the concept of limits. "The Physics Teacher," Vol. 34, No. 6, pp. 342-343, 1996. Let me try to address points 1-3 above with the graph below. 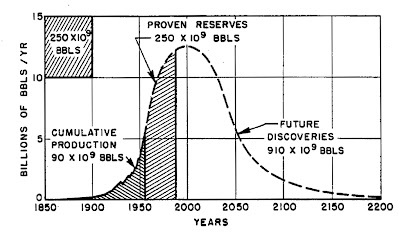 I have digitized King Hubbert's original prediction of global oil production from his 1956 Shell Development Co. report. I have superimposed the actual history of world's production of crude oil (petroleum) and the associated lease condensate liquids in millions of barrels of oil per day (MBOPD). Over the last 8 years, this rate oscillated around 72-74 MBOPD despite of the whole world trying to do its best to meet the ever-growing demand for petroleum. 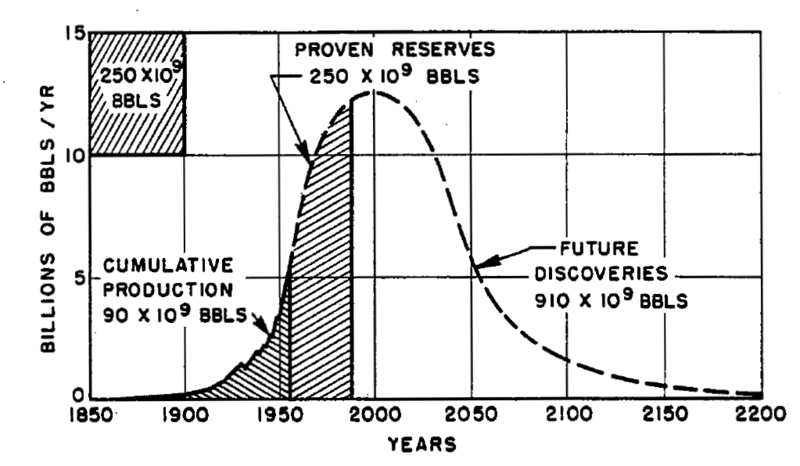 King Hubbert's prediction of global oil and lease condensate production revisited 54 years later. The actual production data are from a combination of EIA statistics and other sources for the early production. 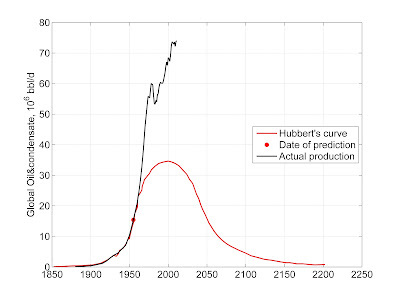 It seems that Hubbert got the timing of the plateau (peak) of oil production almost perfectly, and he was off by a factor of two in the production level. He could not have possibly accounted for the offshore production in the North Sea, Nigeria, Angola, Brazil, deepwater GOM, etc. He had no way of predicting the discoveries and ascent of Cantarell, Tengiz, Majoon, Samotlor, Zakum, Prudhoe Bay, and many other supergiant oilfields. Most of these supergiant fields have now been discovered and it is increasingly unlikely that more will be discovered in the future. Hubbert's data said nothing about about the impact of 3D seismic, deviated wells, horizontal wells, massively hydrofractured wells, drilling in two kilometers of seawater, etc. Yet, almost 60 years ago, Hubbert was off by a factor of two in the production level and perfect in the timing of the peak. Now think about an economic forecast for the entire world that is this good after mere 10 years. If you find one, please share it with me and I'll refer to it in this blog. Given the incredible impact technology (point 4 above) has had on petroleum production worldwide over the last 60 years, Hubbert's prediction is close to a miracle, demonstrating that the sum of uncorrelated random variables (annual increments of oil & condensate production from all oilfields in the world) with arbitrary distributions and finite variances does tend to a Gaussian, no matter what economists and other laymen say. Hubbert simply did not have enough random variables in his data set, because these variables were still in the future when he plotted his Figure 22. In the intervening six decades, technology created by people like me brought these new random variables (oilfields) to life and doubled the production outcome, but did not change the location of the peak. Point 5 needs careful addressing beyond the scope of this simplistic blog. Basically, if the power expenditure necessary to produce a resource is greater than the power delivered by that resource, production will stop even if payments are in pure gold. The large mudstone formations, falsely called "shales," are very difficult to produce and a lot of power must be invested for these formations to produce power as light crude oil. Thus our ability to produce the low-quality impermeable mudstones at sustained rates reminiscent of the high-quality permeable oil fields, like Ghawar or Cantarell, is nil. Period. I'll leave it to the real experts: journalists, economists and fifth graders, to paint a pink rosy picture of the new limitless opportunities. Now let me focus on my other favorite subject: demonstration of the cosmic arrogance and limitless ignorance of some economists. My least favorite economist, Dr. Julian Simon, is famous for his belief that there are no limits to growth, and for "defeating" Professor Paul Ehrlich in the equally famous commodity bet. As Professor Bartlett dryly observed, even if Simon was off by a factor of 1,000 (economists habitually are off by a lot) in his estimate of duration of the future expansion of humanity (7 million, not 7 billion years), and humanity grew by only 1 percent per year, the number of humans would exceed 10 to the power 30,410. It turns out that Simon's prediction of the number of humans supported by technology and economics is 1 followed by 30,000 zeros times larger (like in 1,000,000,000,000,000,000,000,000,000,000,000,000...) than the number of atoms in the Universe. How does Hubbert's factor of 2 strike you now? My other all-time favorite is a 3-day prediction by Irving Fisher, a Yale economics professor, who on October 21, 1929, stated: "Stocks have reached what looks like a permanently high plateau." Three days later, Black Thursday ushered the United States into the Great Depression. Recently, another genius economist from Princeton declared that oil was irrelevant to modern economies. My first personal encounter with the high-power economic forecasting was at Shell. Shell paid a fortune to Goldman Sachs, Chase Manhattan Bank, Deutsche Bank, and a dozen other organizations for the crude oil price forecasts spanning a range from 1 to 30 years. Shell was very happy with these forecasts, until we plotted all of them together, with several years of starting points. All the zigzags would start tangentially to the last segment of real data and then would wander off in every which direction literally covering the entire page like tangled spaghetti, with the predicted end-prices ranging from $5 per barrel to $300 per barrel. We concluded that these very expensive economic guesses had no predictive capability, and settled on a constant low oil price for business planning. Since the year was 1985, that rough engineering guess was good for almost 20 years and cost nothing. Seest thou how God with his lightning smites always the bigger animals, and will not suffer them to wax insolent, while those of a lesser bulk chafe him not? How likewise his bolts fall ever on the highest houses and the tallest trees? So plainly does He love to bring down everything that exalts itself. Thus ofttimes a mighty host is discomfited by a few men, when God in his jealousy sends fear or storm from heaven, and they perish in a way unworthy of them. For God allows no one to have high thoughts but Himself. History of Herodotus, VII, 10, translated by George Rawlinson (1910). 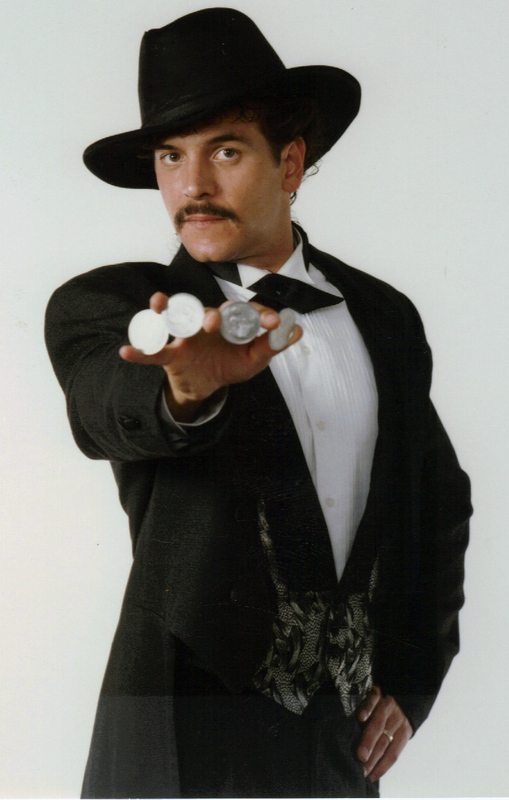 Come to think of it, I have not seen recently any economists sacrificing their best rams or bulls as offerings to God, so that He may shine some light on the opaque magic they call forecasting. An economic forecaster at work. Now you can see more clearly why we believe the economic dilettantes so much. P.S. And here is how the 1972 predictions of the widely discredited Club of Rome look like 30 years later. Did you check them? Not bad for a bunch of ignorant fools those scientists were according to Dr. Simon and every other main-stream whatever. Now think for one second what will happen if their predictions continue to hold on this finite spherical Earth? Yes, I can hear you saying : "Why bother thinking about such unpleasant things? We shall always get more, way more of everything with our superior technology. We always did." P.S.P.S. I deeply value wisdom of some economists. In particular, Professor Nicholas Georgescu-Roegen has changed my life forever. My two-year study of his magnum opus, "The Entropy Law and the Economic Process," 1971, Harvard University Press: Cambridge, Massachusetts, and the dozens of monographs he quoted there, changed my outlook on everything, and made me a different scientist. The writings of Professors Filip Mirowski and Herman Daly have also impressed me greatly. The problem is that these giants of science have been thoroughly ignored by the mere technicians and dilettantes (see the photo above), who also call themselves main-stream economists. Great post. I'm in your camp here, but to examine our views, what if it is possible to continue increasing natural gas liquids and unconventional oil and keep the plateau going despite conventional's decline? I feel like I have invested much mental energy, as have many peak oilers, in the idea that the peak will come and go, not become a decades-long plateau. And despite Hirsch's expectation that we are only a couple of years away from the long decline in production, that decline seems to be nowhere in sight. That's a popular 'what if? '; the question of a scenario in which some combination of technology and resources will serve to extend the energy plateau. It seems pretty obvious that prolonged usage of fossil fuels will further contribute to anthropogenic climate warming. Also, from what I've read and believe to have understood (e.g. Limits To Growth 30 Yr Update), there are such a great many significant factors pointing toward an overshoot and collapse scenario within the next generation, that such an extension of conventional finite resources will become moot. Nobody seems any good at forecasting details, but the basic behavior of our human system and of nature, seems to have some pretty well established and generally predictable patterns. Great post, I am very pleased to have found your blog. It is a mystery to me, yet I think it says something about the nature of life on this planet, that Daniel Yergin and Paul Krugman are hailed as visionaries while no one knows who Albert Bartlett is. It seems to me that humanity is on a collision course with hard limits to growth. The global economic system seems like the kind of complex system that is doomed to fail when under duress. Yet the modern day temple priests (economists) insist human ingenuity will overcome all obstacles, so never mind that brick wall we are speeding towards. I view the economic system as the arena where finite resource depletion, particularly crude oil, will hit first. Maybe I am a bad person or confused, but I am hoping that Export Land Model will destroy the global economy before we start down the backside of crude oil production. I feel that the 2008 economic collapse will prove to be terminal, like a stroke that leaves the patient on life support. If the respirator of stimulus money and massive government debt is shut off, the patient will immediately die. I hope this is the case because I believe man will completely destroy what is left of our ecosystems if we continue industrial civilization for much longer. Then humanity is left in massive overshoot with a degraded environment that will support even less post industrial humans. Pay now or pay later, I say pay now. And thanks to the brilliant leadership of the cultist of the human ingenuity sect (economist), it looks like we may pay sooner rather than later. Living over Marcellus shale I am very frightened of industrial scale unconventional natural gas production wrecking my county. One failed well casing in my area and my aquifer could be down for a million years. The thought of midnight haulers dumping waste water, with no regulatory body like the Texas Railroad Commission to keep contractors honest, keeps me up nights hoping for the demise of the big shale players. I realize you feel like unconventional gas could be a bridge to a new energy source, but I feel looking at the current leadership (billionaires) it is a bridge to nowhere. Post industrial humans left with well casings of concrete and steel quietly degrading underground. I hope that view is overly pessimistic but I have imagined what would happen to the well casings in say one hundred years. It is a shame that Albert Bartlett was not made permanent emergency dictator in 1970. I think that is what it would have taken to avoid the bitter harvest we are set to reap. I love your writing and look forward to reading through this whole blog. I hope I did not offend you with my thoughts on unconventional gas plays; I also wish the same for the oil sands and the tight oil plays as well. I really do love humanity I just think taking the medicine now is our best hope. It would be great to be proven wrong however. 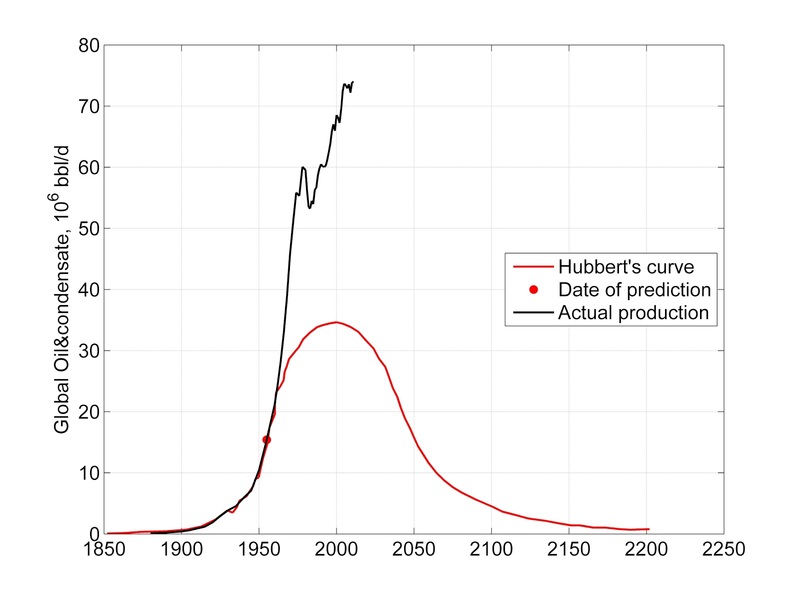 The plateau of oil production we seem to be on right now is an ominous 40 years forward on the Hubbert curve model which forecast it. Maximum new discovery was in the mid 60s, we’ve been on this plateau since 2005 and no matter how high oil prices went after that, production output has hardly budged. That puts us right on the Hubbert 40 year schedule, and we seem to be scrambling for the last dregs of oil in the tarsands or oilshales, anything to keep our beloved wheels turning. But that is not our greatest danger. Consider those who advise our political masters that ‘all is well’ and that energy availability will go on, quite literally into infinity. From reams of such nonsense, I quote Peter Huber, Graduate in Law from Harvard, and in Mechanical Engineering from MIT, currently senior fellow at the Manhattan Institute. Author of ‘The Bottomless well’ and numerous other learned works. A man of intellect obviously. Yet he claims (in The Energy Spiral, 2002) : “the more energy humans use, the more they will be able to produce” his theory is that in the hundreds of millions of years of evolution, every species has always found new ways of absorbing and using energy, and humans are no different, we are constantly learning how to use greater amounts of energy. In his opinion, the more energy we burn, the better we get at finding more. Huber calls this a ‘chain reaction’, or even more bizarrely, a ‘perpetual motion machine’. That phrase alone should set alarm bells ringing, paricularly when suggested by someone who has advised the government on energy policy (Prepared Testimony of Peter W. Huber before the United States Senate Committee on Commerce, Science & Transportation, 10-1-02) . Exactly the words deniers of every shade want to hear, the sound scientific principle that we can not only eat as much cake as we want, but there will be more left than when we started eating. Personally, I’m a graduate of the Micawber school of economics, but this time I fear that nothing is going to turn up. Price is the answer to your "what if." When consumers can no longer purchase the increasingly expensive, craptacular oil, then you have a scenario that IS the ramification of peak - not the solution to it. Great post, but I'm a little confused as to point #5, if something takes more energy to produce than you get from it,it will not be produced. I understand that agriculture takes 10 times the energy that you get from the food produced yet it is still done in this way. Fossil fuels are still used to produce the food that then gives us 1/10th the amount of calories. Why is this? You are correctly pointing out a serious problem with our food supply. We mine fossil fuels to produce, process, store, and distribute the food like-edible substances most of us consume. This consumption is completely unsustainable, and most people have no idea that they regularly eat natural gas, crude oil, and coal. My papers, "Thermodynamics of the Corn Ethanol Cycle," and "Thermodynamics of Agricultural Sustainability: The Case of U.S. Maze Agriculture," thoroughly discuss our dangerously degenerate food supply system.